Being a mother of a newborn is a tough job. Babies require a lot of care and attention, and they will change the routines of the whole family for several years. Babies and sleep is one of the most discussed topics in the baby-care. If you have reached this page, you’re probably looking for a simple and clear baby sleep guide to solve your child’s sleep issues once and for all. Why Can’t Your Baby Sleep Longer at Nights? To understand how to get a baby to sleep, you need to be aware of the main differences between the newborns’ sleep and the nap-times of older children and adults. And there are quite a few of them. Firstly, sleep patterns of newborns are tied to their feedings. Since the capacity of their stomach is small, babies cannot sleep for more than 2.5-3 hours in a row until they reach at least 3 months. Now, you probably know that small children under the age of 3 years sleep on average 12-17 hours a day. 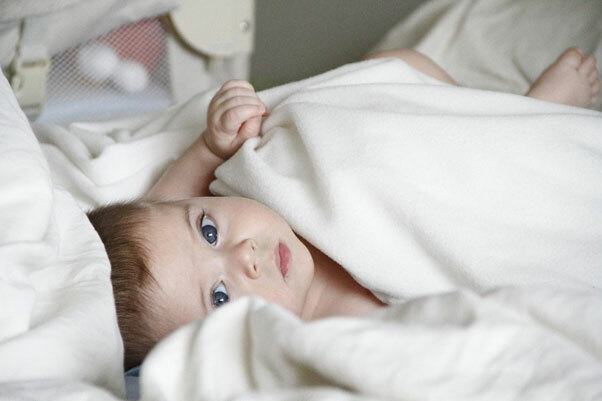 Up to 50% percent of this time babies spend in the light sleep phase (it is also called REM, or Rapid Eye Movement). This allows them to actively absorb the information obtained during the day, but at the same time, they become very sensitive sleepers. In addition, the circadian rhythms of babies fully develop only by 6 months. And the first 3 months of their lives, they do not distinguish between day and night, so the happy hours of wakefulness can fall in the middle of the night. Which is not a pleasant perspective for their parents. basic needs — often, the child is just hungry or needs a fresh diaper to get back to sleep. Notice when and how your little one’s behavior changes. If they are too sleepy or begin to show significant shifts in their sleeping patterns, please make an appointment with a doctor. How to Help Your Baby Sleep Better So That You Could Have Good Rest Yourself? Problem-solving and the establishment of healthy sleep hygiene for the whole family. Here comes our baby sleep guide! First things first. You need to schedule hours of sleep and wakefulness that will be suitable for both you and your little one and thoroughly follow it. Try to make the night periods of sleep longer. That will result in better rest for you too. After all, a vigorous mommy means a happy family. Stick the naps and wake-ups around to the same time. This will help your little one to quickly adapt to the new schedule, and you will be able to plan your daily routine with this reference on your hands. Use soft dimming lamps, as well as natural light, to familiarize the child with the change of day and night and adjust their biological clock. In addition to the established schedule, you also need to adjust the level of activity of the baby. That is, control the daytime naps. If necessary, you can wake the child and play with them. The aim here is to help your baby start associating day with activity and playtime, thus helping them turn their circadian rhythms on. A warm bath with extracts of calming herbs, such as chamomile or lavender, can become a useful ritual before the night’s sleep. You can also think about changing the diaper in advance and purchase special night diapers, which have a greater capacity. If your child does not have a diaper rash, then you can change the diaper at night only if it is soiled. A mother’s milk is the best calming agent for a baby. That’s a fact. And sometimes getting a newborn to sleep by nursing them is a rather tempting and easy option. See, the baby’s body might quickly develop a reflex of falling asleep during the feeding. This means that they will eat until falling asleep, not until satisfaction. A hungry newborn might become a nightmare for the whole family. Try to gradually break your tot’s association between nursing and falling asleep. Keep them awake while feeding, but relaxed and slightly sleepy. And lay your baby down to sleep only after they are full. The environment you put your child to sleep in has an important influence on their levels of comfort and sleep quality. 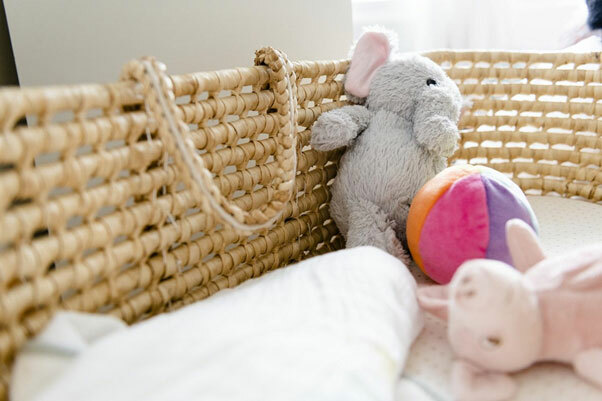 You can use the tips below to make your baby’s room more sleep-friendly. Use dim lights. It is best to use soft, diffusing lamps and get a crib canopy or isolate the crib from the rest of the room with a translucent blanket. Maintain a comfortable room temperature and humidity. You can purchase a humidifier, it will also contribute to the prevention of allergies and rhinitis. Use a white noise machine. This device will help the child’s nervous system calm down and will improve the quality of their rest. Should the baby sleep in the same bed as their parents? There are many opinions on this topic. 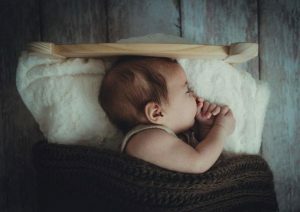 Of course, you can think in the ways of your own comfort, but according to recent studies, those families that get their baby to sleep in their own crib have a better quality of rest overall. The answer is the same as a few points above. Reflexes. If your little one has a personal sleep surface, it is much easier to teach them to self-soothe and fall asleep without your help. To do this, put your baby in a cradle while they’re drowsy but not completely asleep so that they could associate their rest with this place. In addition, do not rash out of bed when you hear a single sound from the crib. Give the baby a few minutes so they can soothe themselves alone. Only get up when you’re hearing that the baby had woken up completely. It is best to just shake the bed with your hand or just pat the baby on the head instead of moving them. They will feel safe and most likely will fall asleep again.